The optical module and components industry has responded to these demands with 100G solutions that already cost less per gigabit than equivalent 10G and 40G solutions, and new developments to further drive down cost and increase bandwidths. The keys to these 100G developments have been low-power and cost-effective 25G components, and smart assembly of optical modules either by using standard subassemblies with automated test, or by the use of silicon photonics or similar technologies. These developments have enabled a shift to modules with four 25/28G lanes or wavelengths for 100G Ethernet. The next step is using PAM4 coding in place of NRZ. The first components and optical modules using PAM4 are already becoming available, supporting 100G with two lanes/wavelengths, 200G with four lanes/wavelengths or 400G with eight lanes/wavelengths. The ultimate goal for client-side component and module vendors at the moment is single-lane/wavelength 100G, using PAM4 and 56 Gbaud serial lanes to further drive down the cost and real estate for 100G. This also enables four-lane/wavelength 400G and eight-lane/ wavelength 800G. The IEEE has agreed on PSM4 with four parallel fibers for the 500 m 400GBASE-DR4 specification that is part of the IEEE802.3bs standard being developed for approval by the end of 2017. The industry is already developing solutions including semiconductor and optical components, and optical modules for all of these applications. The QSFP28 modules for 100G Ethernet and SFP28 modules for 25G Ethernet are now the dominant form factors. CFP, CFP2 and CFP4 remain important for some applications but have been eclipsed by QSFP28. The first 200G modules for data center and enterprise applications are using QSFP modules – either QSFP56 or QSFP-DD. The big question is, what is the right module for 400G? The first CFP8 modules are already available. QSFP-DD is backward compatible with QSFP, and OSFP may deliver better performance, especially as networks move to 800G interfaces. Coherent technology developed for 100G long-haul networks is now enabling 200G, 400G and 600G connections in metro networks and between data centers. The market for data center interconnect (DCI) and metro networks is growing rapidly, with many systems vendors offering solutions in the all-important 80-500 km reach. New digital signal processor (DSP) ASICs and CFP2-ACO modules are giving equipment manufacturers many options with support for multiple modulation schemes including coherent DP-QPSK, 16QAM and 64QAM. For long-haul and metro applications, many equipment manufacturers are currently using in-house designs. That may change with the latest DSP and module developments, and with Ciena making its coherent technology available to three leading optical module vendors. This is a market in flux. Several new players have recently entered the market with innovative semiconductor and optical components or new approaches to module manufacturing. Several vendors that are focused on supplying optical modules direct to service providers, and therefore shortening the supply chain, are now delivering on a wide range of 100G modules. We are also seeing several Chinese vendors expanding their sales outside China and offering large product portfolios. Established players are responding to these challenges with highly integrated products and investments to deliver on the latest requirements. Silicon devices are critical for 25-600G systems and optical modules. Transceiver and gearbox devices integrate support for the different modulation schemes. PAM4 PHY/Mux and 50G CDR devices are required for the latest optical modules. Laser driver and receiver arrays enable cost-effective optical modules and packet-optical transport platform (P-OTP) devices integrate most of the functionality for 100G and 400G P-OTP systems on a single device. From 25/100G to 400/600G: A Competitive Analysis of Optical Modules & Components identifies key networking, optical module and semiconductor technologies and details their application to 25G, 100G, 200G, 400G and 600G ports, identifying and analyzing the full spectrum of vendors developing optical modules and components. The report includes not only granular information on the optical modules and components themselves – of interest to telecom equipment manufacturers, service providers, optical module vendors and semiconductor vendors – but also insights into how the overall market and ecosystem is developing – of interest to a wide audience, including investors. This report is based on interviews conducted with a wide range of optical module and silicon vendors, along with product information supplied by vendors. The tables presented in the report are based on product documentation and supplemental data from our interviews and email conversations. All the data in the product tables has been provided to vendors for confirmation, feedback and updating ahead of publication. The excerpt below illustrates the kind of in-depth, granular information provided in this report. 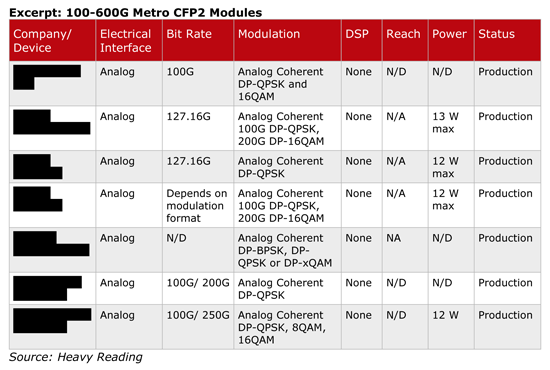 The table shows a selection of the 100-600G Metro CFP2 modules available from companies such as Acacia, Finisar, Fujitsu, NEC, NeoPhotonics and Oclaro. From 25/100G to 400/600G: A Competitive Analysis of Optical Modules & Components is published in PDF format.